LEONID OLIJNYK FRSASA IAPP is a Fellow of the Royal South Australian Society of Arts and a Licentiate Member of the Australian Institute of Professional Photography. Congratulations on your success Leonid! 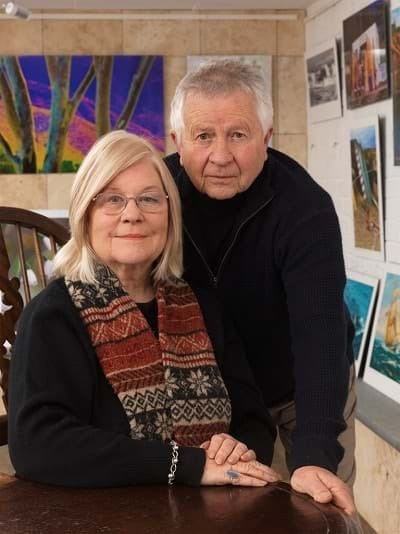 In 2018 the Royal South Australian Society of Arts awarded Leonid Olijnyk a well deserved Diploma of Fellowship. The Fellowship is recognised throughout Australia and overseas. In the publication "A Visual History 1856 - 2016" by Adam Dutkiewicz, Leonid is also recognised as a Contemporary Artist of South Australia. Congratulations on the recognition of your spectacular art images Leonid! Elynor Olijnyk is a Member of the Australian Historical Association and The Australian Association for Maritime History. Elynor has published two Australian histories -"Taking Possession, A Saga of the Great South Land" revealing the 'possessing' of Australia by the first indigenous people and the arrival of settlers from the far side of the world. "Charles Robbins RN 1782 - 1805" is the remarkable chronicle of a young, passionate and abiding member of the English Admiralty. The books are for sale from the Gallery. Their Gallery offers visitors a magnificent exhibition of fine art photographs printed in house to perfection on archival materials. Leonid has a unique style of photography and presentation that is completely original. Using precision cameras and printing his own work he achieves truly spectacular images that he is thrilled to share with everyone. Limited Edition Landscapes, Flowers, Contemporary Portrait, Surf Life Saving and Historic fine art photographs are available for purchase. Our Photographic Studio offers Individual Portraiture, Restoration and Reproduction of Art Work. Address: 6 Yalpa Road, Marino, South Australia.